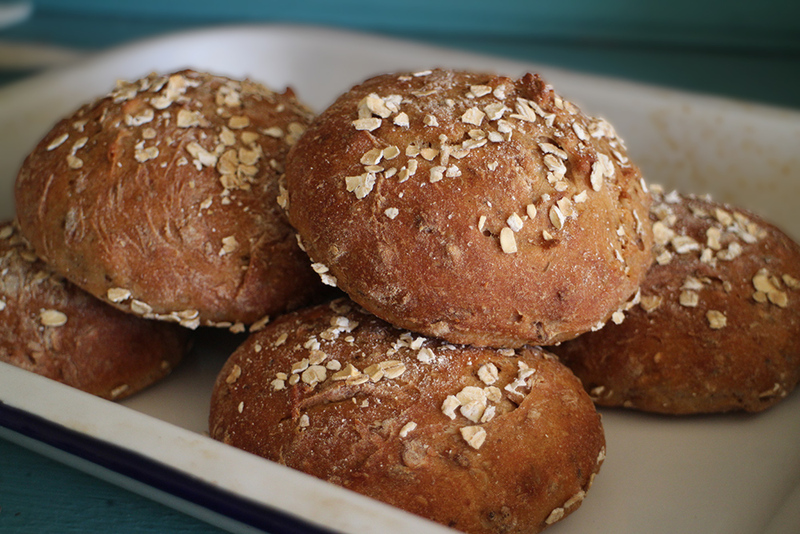 Today I have had bread rolls for lunch and bread rolls for dinner because these ‘oat topped bread rolls’ were so delicious that I couldn’t stop. I’d run out of bread at home and it was easy to knock up a small batch of rolls and cheap too! Using the basic home-made bread recipe used on the home front during WW2 (fat free) it didn’t take long before 6 large bread rolls appeared out of the oven and filled my tummy. 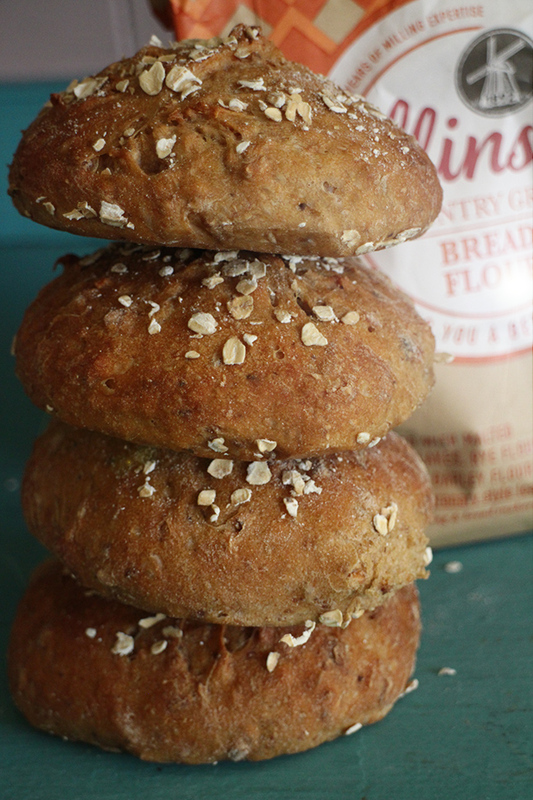 Instead of using plain flour I used one of my favourite flours (which was open in the cupboard already) and that is Allinsons Country Grain Bread Flour which is so tasty, chewy and malty with whole grains in. 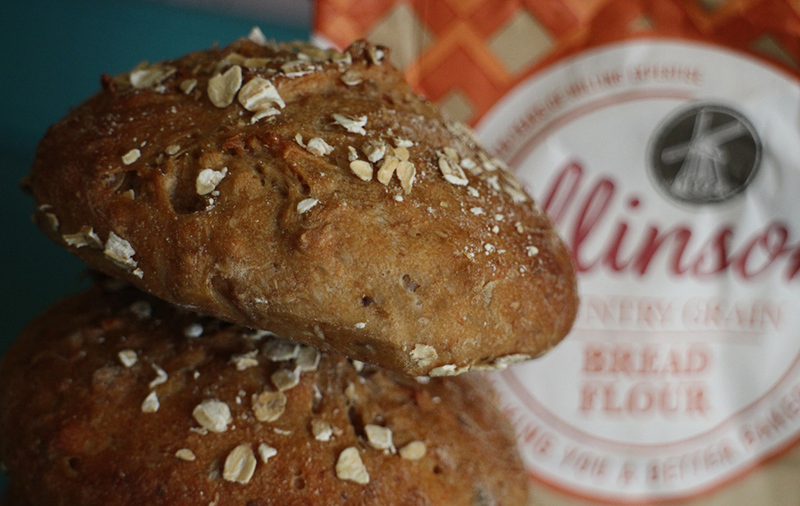 Total cost: I worked out the cost to be under 5p per roll using a store brand strong bread flour and it was under 10p per role using the ‘Allinsons Country Grain Bread Flour’. Place flour, yeast, sugar and salt into mixing bowl and mix. Add in the warm water and mix well adding more water or more flour as needed until it is the right consistency. Remove dough onto a floured board and knead until it feels nice and stretchy and elastic. Use parchment paper to line a baking tray (with sides) and divide the dough into six round balls and slightly flatten. Remove cover, sprinkle with some oats, and place in a pre-heated oven at 180c for about 20 minutes or so. Leave to cool on tray once removed from the oven. ← How did January’s budget go? They look delicious! I will be making some today! Your bread roll recipe has inspired me. I’m also going to make some today. I don’t have a grain flour so I’m soaking some rolled barley to add to the other ingredients. This morning I was thinking I’d have to buy bread as I’m nearly out – funny how I think of what’s in the shops rather than what’s in the pantry when I’m low on food. They look great! Could you add nuts? How large are they in relation to hand size? I’ve never made my own bread before. Wow — I just found out about your blog and am really happy you’ve had such success with these recipes! I used to have some of Marguerite Patten’s books on wartime rationing (We’ll Eat Again, etc.) and used to have the potato-pastry pasties for lunch at work. The books left my possession when I had to downsize (I understand having those tough years), but the memories are still vivid. 🙂 Summer Vegetable Pie and the different charlotte recipes were also favorites. I’m looking forward to reading more from your blog. Those look delicious. I must try them this weekend. On another note I made you eggless pancakes this week. Loved them and so easy. I had some milk that needed using up so I made about 20 and froze them putting greeseproof paper between each one to stop them sticking. Some I will stuff with a savory filling. Thank you for the recipe.